UPDATE: The detained man has been released without charging. Police may be closer to solving a string of Lakeview armed robberies after a man reported being robbed at gunpoint this morning and a suspect was taken into custody for questioning. 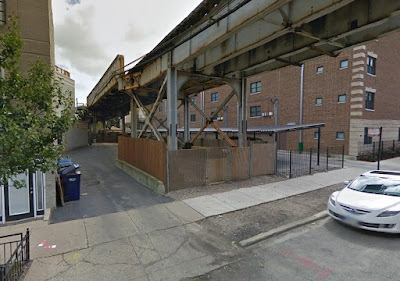 The vehicle crashed here, under the Brown Line tracks at Racine. The victim told police that two men produced a handgun and robbed him near the intersection of School and Clifton shortly before 3AM Friday. The offenders’ technique and descriptions were similar to those detailed in a February 23 police alert. A sergeant who was aware that a light-colored SUV was suspected in some of the robberies came across a similar vehicle about 90 minutes later near the intersection of Racine and Cornelia, police said. The driver saw the officer and sped off, quickly crashing the stolen car into a fence under the Brown Line tracks near Racine and Newport. Two occupants bailed out and fled. One was taken into custody for questioning near Seminary and Newport while the other remains at large. Evidence in the vehicle is being reviewed for connections with reported robberies, an officer said. The detained man remains in police custody this afternoon.